The Kenya Publishers Association on Thursday came out to defend itself against public condemnation over illustrations in some newly-published textbooks that people find inappropriate. 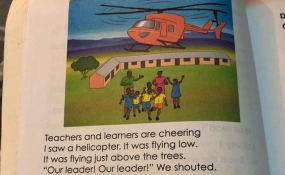 The association, led by its chairman Lawrence Njagi, said the illustrations are suitable for early primary school children but disowned others falsely attributed to them. During a press briefing in Nairobi, Mr Njagi in particular defended an illustration for Grade Two textbook that depicts a flamboyant MPs visit to a school. The caption on the illustration reads: "Teachers and learners are cheering. I saw a helicopter. It was flying low. It was flying just above the trees. 'Our leader! Our leader!' we shouted. It was our Member of Parliament. He travels in a plane. It belongs to him. The helicopter landed in our school playground. Three big cars arrived in our compound. They too belonged to him. He came out and greeted us. His wife waved at us. She had golden rings in her hand. He told us if we do well, he will give us a treat. He will lift us up the skies. I will try my best." In response to the complaints by Kenyans, Mr Njagi said adults are interpreting it in the wrong way and thus distorting the intended meaning. "There is nothing factually wrong with that passage. The passage should be looked at in the eyes of the child not in the eyes of the politician or us the grown-ups," he said.